The SURREAL TOWER project at LEA8 ends with a new beginning: A TALK, A READING, A SHOW. March 31, 1.00 PM SLT Art Blue presenting 2BR02B by Kurt Vonnegut in voice (music stream) provided by LibriVox. After this Venus Adored will celebrate by performing “The Battle for Blue” the end of his LEA core grant at 2.00 PM SLT. Visitors are invited to stand on the “Ladders of Surreality” at LEA3 so LEA8 is not affected by lag caused by the show which includes a deconstruction of the SURREAL TOWERs. Art Blue known as a conceptual artist, curator and writer invites you to a Metaharpers Flight experience at LEA8 presenting the SURREAL TOWERs made by Art Oluja (Artistik Oluja), Gem Preiz, Instincta & Stem van Helsinki, Mary Wickentower, Maya Paris, Mikati Slade, Moewe Winkler, Tansee Resident and Uan Ceriaptrix. Meataharpers is an open source product made by Arrehn Oberlander - it takes over your camera controls. Lorin Tone and Frankx Lefavre are still working on their towers on own land given by a LEA AIR 6-month grant. They will be added in the next month. Same goes with Bryn Oh made by Chance Acoustic. 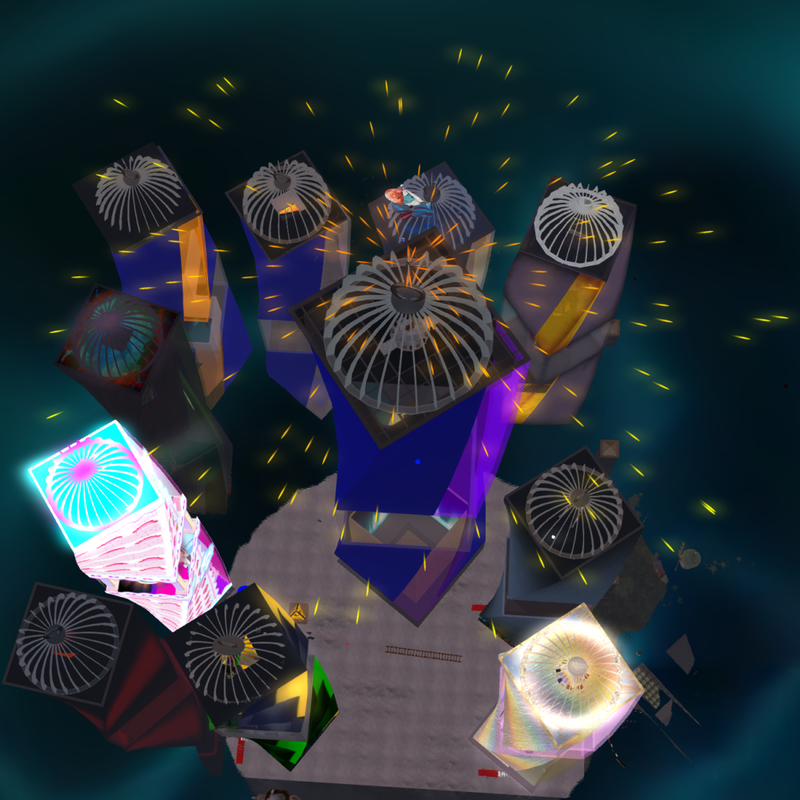 Works by Fuschia Nightfire, AM Radio, Feathers Boa, Soror Nishi and Fiona Blaylock will move into a SURREAL TOWER named “The Blaylock Tower.” Molly Bloom will be added as Art Blue´s personal choice arranged by Art Eames, Kai (Kaishun Oleander) and Jami Mills. In this tower “The Moons” from Art Blue´s former LEA grant “Moonrezzer” will be added in form a rotating presentation. VJKrieger and CyberXstrike – both RL students in Art Blue´s lab - will work at flight attendants and instruct the visitors. March 31, 2016: Metaharpers flights are offered on demand up to two hours before "The End" at 1.00 PM with a sim restart in between, so time information is not precise. Visitors are asked to leave LEA8 and move to LEA3 at 1.59 AM. Each flight takes about 15 minutes. Please arrive 10 minutes before to get the instructions and to do a short test flight in one of the towers. At March 31, 1.00 PM Art Blue will experience 2BR02B and face his end with the towers which will demolish as the end of the grant comes close. Juliette SurrealDreaming will speak the obituary for him and introduce a follower of Art Blue coming from the future. Venus Adored will play The Battle for Blue to guide Art to the next level of existence in opensim worlds where the towers are waiting for him for eternity. Come to get a look on the epic SURREAL TOWER project where in a simple hull some of the most gifted artists in virtual words followed the invite of Art Blue to bring virtual immersive art to life, a life extended beyond the limits of space and time. Artists once supported by a grant by Linden Endowment for the Arts shows their interpretation of being surreal real for eternity. SURREAL TOWER will be presented at the Santorini Bienniale 2016 in a group exhibition on a variable area sim landscaped by Cherry Manga. For the first time virtual art is recognized alongside other forms of art in a real Biennial.